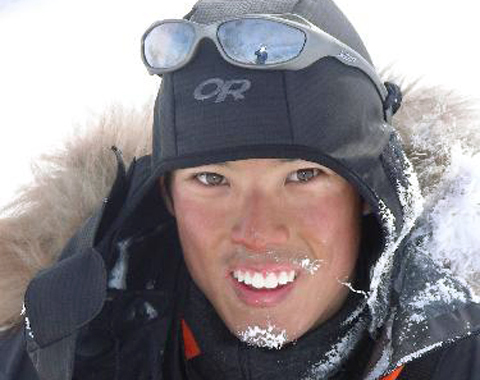 In 2006, Roger was awarded the Young Adventurer of the Year Award by the Australian Geographic Society. This was given in recognition of a world first unassisted mid-winter traverse of both the Western and Eastern Arthurs, combined with a successful mid-winter ascent of the treacherous Federation Peak, a world first. Roger has been elected as a member of the Explorers Club/New York and a Fellow of the Royal Geographic Society. In 2007, he completed a full east-west ski traverse of the Greenland Polar Icecap, fighting 200km/h winds and -45 °C (excluding wind chill) temperatures with a 130 kg sled and pack. He was the youngest person ever to complete a full east to west traverse of the Greenland icecap unsupported and unaided. Throughout his life, he has served as a section rep and delegate for Search and Rescue attending numerous callouts in all conditions/terrain, as well as serving as president of the Monash Bushwalking and Outdoors Club, being selected for Monash University's Vice Chancellors Elite Athlete Support Program and being awarded a commendation for outstanding achievement from the Dean of Arts. Roger has a huge plethora of media experience, having provided photos and writing articles for magazine such as The Australian Geographic Journal, Wild magazine, adventure and outdoors magazines, and well as in newspapers such as, The Herald Sun, The Leader, The Mercury, and others. He has been interviewed live for numerous pod-casts, national television, national radio and made numerous presentations to large audiences on issues such as exploration, leadership and motivation, climate change, and global warming and indigenous cultures. Roger also has a long standing wealth of outdoor experience including leading groups as a section representative and delegate for Search and Rescue with the Victoria Police, and as well as serving a term as President of the Monash Bushwalking Club. He is qualified as a Swift Water Rescue technician, in Vertical Rescue, as Wilderness First responder, Technical Mountaineering certificates, and a many other outdoor skills. Roger has extensively paddled, skied, climbed and mountaineered around the world as well as all throughout Australia. Roger has also worked as an environmental consultant for the Office of Environmental Sustainability, as a forest campaigner for the wilderness society, as well as a professional Expedition Consultant and guide for individual clients, corporate teams and schools, and as well as a guest speaker/MC at many events. In mid 2007 he also completed a study of the effects of Global Warming on Inuit culture in a remote east coast village in Greenland, staying with numerous village vhieftains, dog dledders and hunters, documenting their lifestyles and traditions, and interviewing them on camera. These results were later published widely used by various NGO's, as a documentary, and presented at numerous schools, community presentations and corporate presentations. showing the impact of global warming on these remote indigenous communities living on icecaps. Throughout this research he had many schools involved in following his research at which he gave numerous presentations about sustainability and the impacts of global warming on indigenous communities. Roger's has also travelled extensively throughout central Asia on an amphibious tandem sociable recumbent quad. A fully pedal powered vehicle designed for month long desert crossings (carrying all their water for the duration, as well as using some very fat sand tyres), glacier and snow crossings (tungsten carbide spiked tyres, and fat snow floating ones) and every other imaginable terrain. This vehicle was truly all terrain, allowing them to access many different areas on the same vehicle, all pedal powered. In 2009 and 2010 his travels in central asia, centred around documenting the various cultures, traditions, and histories of the people in the area. The objectives that underlied this expedition were that cultural diversity is important, and valuable enough to be preserved. and that here is a lot of indigenous knowledge (natural resource management, care for local fauna and flora, medicine, history) that is only to be found within the hands of peoples that have lived in these regions for hundreds, if not thousands of years. The expedition also reinforced that, as each of these different cultures had evolved throughout unique geographical, social and political climates, there are were different elements of societal culture, tenets and ideas, that were unique to their situation, and that thus, by maintaining the diversity that is present on this little jewel of a planet, we are not losing potential for ideas of how to organize our society better. Their aim was to discover what elements and practices in these other societies might we be able to incorporate into our current societies. Learning from other cultures consists of seeing what does work and what doesn’t work for certain cultures(context dependent), what problems their cultures have and what beneficial elements they have. Then one must ask why it does or doesn’t work. By seeing what faults our culture may have, what solutions other cultures may have to fix this, and what problems they have, we can be better equipped to find solutions to the universal problems that plague mankind. Thus, in the process, one ends up questioning their own beliefs, and garnering new knowledge or perspectives/ways of looking at things. Throughout the expedition, they recorded all this knowledge and culture in various mediums, recording their songs, stories, dances, knowledge, way o life, social structures, myths of creation, the works. The vanishing tribes, if not documented now, will have their wisdom and knowledge (which has been gathered throughout the centuries and passed down from generation to generation) lost forever. "Our current lifestyle as it is, is not the only way to live, there are many things wrong with it, it is only by looking to how other cultures live that we can progress. It is only by looking at other groups lifestyles that we can see how we can change ours, what works in their way of life, what doesn't, what works in our way of life, what doesn't, that we can truly move forward." More : "There are those people today who live the same life, day in day out, predictable, risk free, dreamless, they are the harshest critics of those who strive to break free from this mundane existence. In this world, too many people are afraid to pursue the life they truly desire, too afraid of being criticised by others, too afraid of failing, too afraid of not knowing the way. However there are also those who choose to follow their dreams, those who choose to rebel, those who strive to be free, those who live. Stay true to yourself; break free from the chains of society and live. May you to have the strength and courage to pursue your dreams. ..."